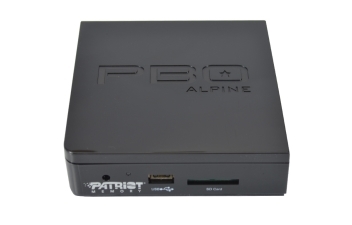 Patriot Memory’s latest media streamer is the PBO Alpine, a hard drive-less streamer rocking Android 2.2 for the OS. The PBO Alpine fully supports network streaming and for Internet media it comes preloaded with YouTube, iTV, iRadio, and Picasa apps, as well as a web browser. Despite its Android roots, the PBO Alpine cannot access the App Marketplace, but it does support sideloading APKs for those inclined to expand the app selection. There have been a handful of Android-based media streamers to date and unfortunately not all of them have been particularly impressive, but it sounds like Patriot has put together a compelling option with the PBO Alpine despite the inclusion of a laughable remote control. It’s not often a reviewer suggests a streamer performs better as the quality of the video file increases. Established in 1985, Patriot offers a wide range of memory products including SSD, flash media devices, desktop memory and multimedia products. According to the Patriot website, the company has offices located throughout the U.S. and Asia. Today we are looking at the company’s latest HD media player, the Patriot Memory PBO Alpine.